...not be allowed to run dry ! 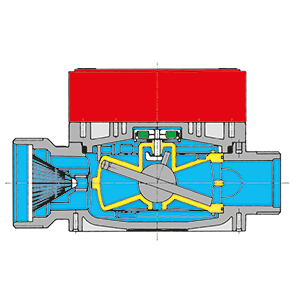 Mechanical seal is used for liquids with solids, dirty liquids, glues, resines. 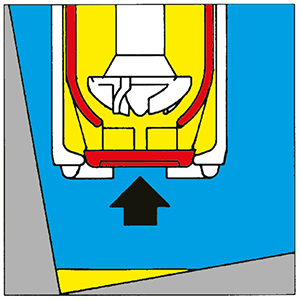 The mechanical seal avoids that the liquid will rise within the inner tube. It is recommended to clean the pump after using. 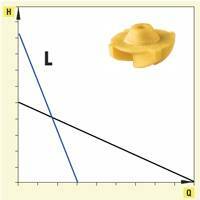 95% applications are sealless use – avoiding problems of sealing failure. The sealless design is able to run dry. Generally - we should avoid dry running. 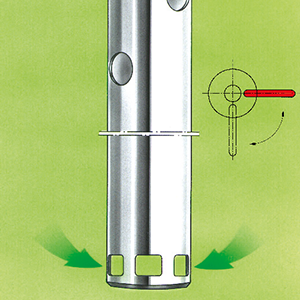 A movable sealing cap locks the pump foot and prevents the entered liquid from flowing back into the drum. 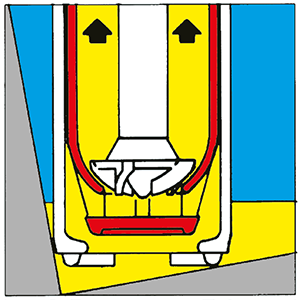 The closing is carried out by a small lever below the hand wheel. 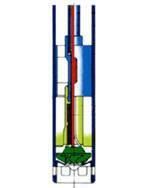 With the motor is switched off, the pump tube holding the liquid can be removed and inserted into the next drum. 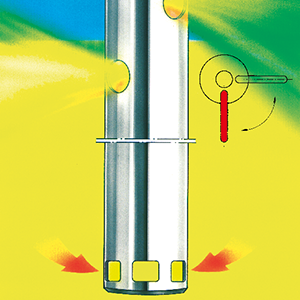 A special locking mechanism within the pump opens and closes the mixing apertures in the outer tube. Operation mode "pump only" and "mix & pump" can be changed by means of a hand lever. 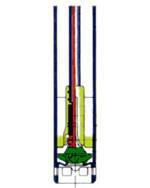 The flowing liquid causes the turbine to rotate thereby it accurately measures the pulses. The measured values are transmitted and processed electronically. Thereupon the good readable display shows the sub total and the volume. The liquid streaming causes a nutating disc to gyrate about its own axis. 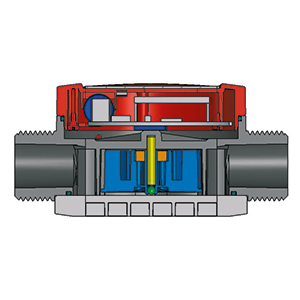 A multi-pole solenoid is made to rotate via a driver and switches a reed contact through the housing cover. The volume flowing through is determined from the number of pulses. 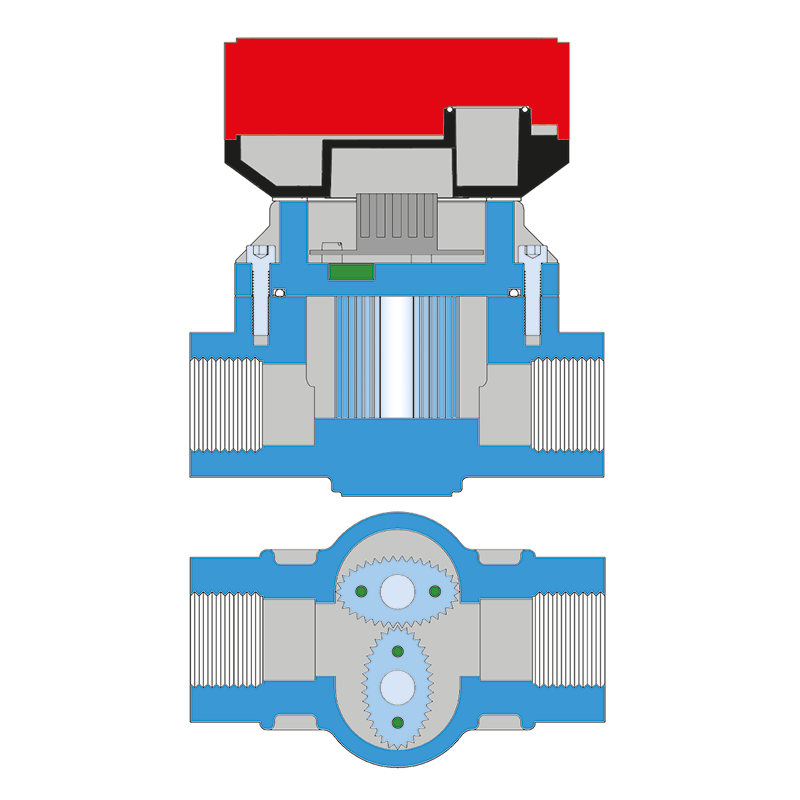 Two oval gears interlocked and displaced by 90° in the meter housing are rotated by the flowing fluid. By means of the two oval gears a defined fluid volume "in portions" is transported. The magnets placed on the rotors are also rotated.A reed contact fitted outside of the measuring chamber records the magnetic impulses produced. 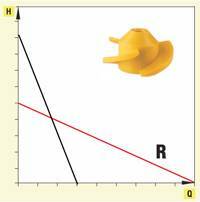 The volume of the flowing fluid is determined by the number of impulses recorded.